Abu Aardvark: Bin Laden dead? Everyone's abuzz about the report in a French newspaper that bin Laden died in late August of typhoid. Is it true? I don't know, but I'm pretty skeptical. Would be odd for such a big story to show up in such an obscure source. For what it's worth, the jihadi boards that I just scanned through are treating the news as a curiosity and as part of the "Crusader propaganda campaign". I just saw a clip of Chirac on al-Jazeera saying that he could not confirm the information (Putin and Merkel each chimed in that they couldn't either). I've seen it reported, though I didn't see myself and so can't confirm, that Chirac repeated the same thing during a short live interview with al-Jazeera. 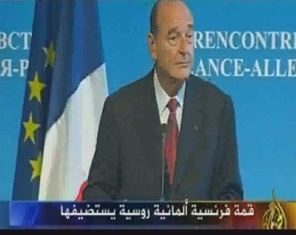 Even the many Arab media outlets who wish bin Laden ill, such as the online Elaph, the Saudi al-Sharq al-Awsat, and the Saudi TV station al-Arabiya, are reporting the story skeptically, with an emphasis on the denials by Chirac and the others and on the reported American inability to confirm the news. None of that is definitive - the Arab media and the random folk hanging out on jihadi forums might not necessaily have inside information - but it's still worth noting. While bin Laden's dying would be a fine Ramadan present for Muslims everywhere, I wouldn't get too excited about this news at this point. When bin Laden does die, we won't need secret sources or leaked intelligence to find out: al-Qaeda's media arm al-Sahab will be ready with a massive propaganda blitz to capitalize on his martyrdom. On another thread I've seen speculation that this is an attempt to flush bin Laden out - hoping that the rumours will lead bin Laden to make an overly hasty video to prove he's alive which might allow him to be tracked down. Take that one as about as reliable as the average blog commentary - someone's interpretation from within that online community, no more and no less. UPDATE, Tuesday: Al-Arabiya is reporting that a senior Taliban official has confirmed that bin Laden is still very much alive. ... and al-Hayat now reports that "friends of bin Laden" confirm that he is quite alive. I would not be surprised at all if this weren't a stealth campaign tactic for Bush/GOP campaign. Not because I despise the Global American Junta, but for strictly political strategy reasons. The timing is just too sweet. FUD (fear, uncertainty, doubt) is a legendary acronym for Microsoft's weapons to depress sales of an announced product that might compete with its own. Watch for how this "news" is spun directly, or outsourced, by the GOP and Fox News. Could hold a clue. Alexis Debat, a former French intelligence official who is now an ABC News consultant, also is skeptical. "There is no hard information the report is true," Debat said. In fact, a source tells Debat the report is based solely on an informal conversation between a French diplomat and low-level Saudi diplomat at social function in Islamabad. The French diplomat felt obligated to pass on the details of that chat to headquarters in Paris and it is has since caused quite a stir. Hi Abu. Just wondering if you saw the article last week in Asia Times about bin Laden's greatly improved health and tactical situation? Since the inforamtion was leaked by the Frensh who wholeheartdly despise the Bush administration, then I really doubt the theory that the GOP or Fox news are behind the consipracy. However, I am sure that they have their own interest of using it in the next upcoming election. What if some clever counter-terrorist suspected that Bin Laden was no longer alive, and that his organization was hiding that fact in order to perpetuate his wily Holy Warrior image? What better way to simultaneously demonstrate that he is dead and destroy his legacy than to float a story of an ignominious death due to disease in a remote hiding place. Great Holy Warriors don’t die because they’re afraid to leave their caves. The source of this disinformation is obvious. Al Qaida is trying to capture the "Left Behind" vote by giving out the impression that OBL may be Jesus Christ. I think he's on his Fifth or Sixth Coming by now. Bin Laden's been dead for years, I'd guess. He supposedly releases audio statements, which also have the risk of detection as they are ferried out from his hiding place through couriers - wouldn't the tiny "extra" (marginal) risk of a video announcement be outweighed by the large propaganda benefits of a video? His released "statements" could be a similar dynamic to the statements from Zarqawi (and the "al Qaeda in Mesopotamia" site) - those might have been created by the pentagon (as per the WashPost story) or by locals: Islamist offshoot groups wanting to claim affiliation with al Qaeda (for rectruiting, PR) or by Sunni/Baathists to have deniability for their bombing activities, when desired, etc. IOW, the players involved (intelligence agencies, al Qaeda remnants, other radical Islamic groups) all might have aligned incentives to keep the status quo narrative out there. And now someone floats a story that he's dead, for whatever reason. When he appears live, on video, holding a newspaper or talking about a recent event, I'll believe he's alive. Since he hasn't for some time, odds are he's dead.